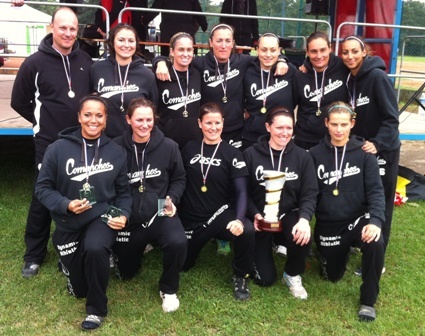 For the fifth straight year the Comanches de Toulon have won the French Softball Championship. On Sunday the team defeated the Meyzieu Cards 12-0 in four innings in the finals. Toulon had reached the title game with a perfect 4-0 record in the playoffs. The Cards had to beat Thiais 16-8 in the semi-final to reach the championship game for the first time since 1985. Toulon’s Raina Hunter swept the individual honors taking home trophies for MVP, best pitcher (9 IP, 2 H, 6 SO in playoffs) and best batter (14-18, 3 HR, 2B, 3B, 16 RBI).